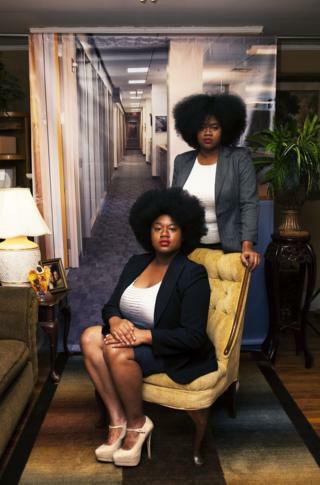 Three photographers are exhibiting work that confronts the way African-Americans are often perceived in art, the workplace, and through their physical appearance. 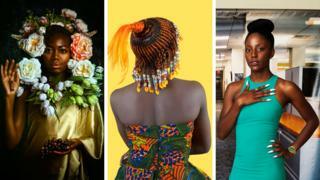 The work, by artists Alanna Airitam, Endia Beal and Medina Dugger can be seen in an exhibition called How do you see me? at the Catherine Edelman Gallery in Chicago. Alanna Airitam addresses the absence of black people in the history of Western art, with rare appearances showing dark-skinned people “represented in paintings and films as domestic workers, slaves or barbarians”. 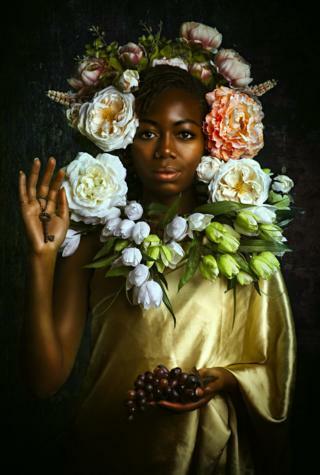 In her series The Golden Age, the artist invited African-Americans to pose in the style of classic Dutch portraiture, to celebrate black identity and highlight the racial divide seen in art history. 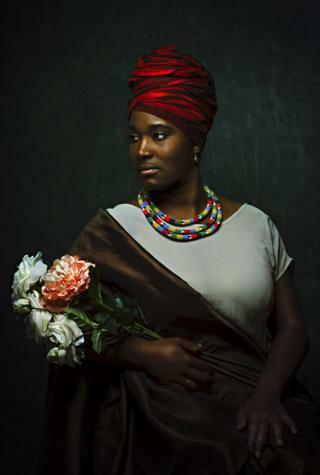 Airitam said: “When I see the beauty and power in the eyes of the people in the portraits, it immediately counters all the negative stereotypes and narratives we receive on a daily basis. 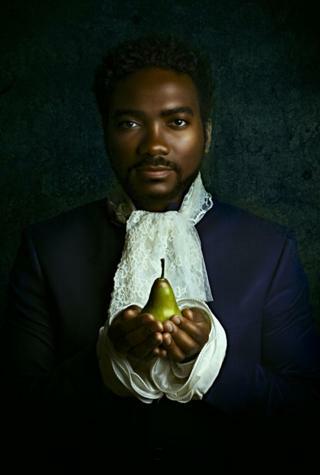 Airitam pays homage to the Harlem Renaissance, a period of American history in the early 20th Century that saw a boom in African-American social and cultural expression, centred around Harlem in Upper Manhattan, New York. The image above is named after Dapper Dan, the Harlem-based clothes designer who defined hip hop fashion in the 1980s and 90s. Many of her images are named after places in Harlem. Airitam says that the absence of black people in Western art made an impression on her as a child going into museums and galleries. “I never saw anyone who looked like me. We were not on the walls (unless shown in a way in which we were serving white people). We did not work there (unless we were cleaning or acting as security; again, serving). The portrait below, named Queen Mary, is of a model named Mary. Her family is from Saint Croix, an island in the Caribbean Sea. Mary shared a story with Airitam about three women who led a successful rebellion against Dutch colonialism in Saint Croix in 1878. One of the women was called Mary Thomas. Airitam decided to name the portrait Queen Mary in honour of the story. 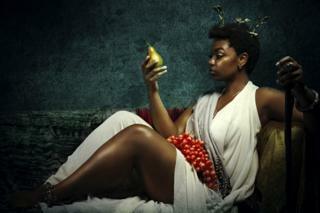 The model is symbolically showing that the key to abundance is self-love, beauty, majesty. In her series, Endia Beal positions her models against a fake backdrop of a traditional office setting, wearing an outfit that the model would choose to wear in the workplace. Beal, a professor at Winston-Salem State University in North Carolina, has spent the last four years using photographic narratives and video testimonies to examine the personal stories of minority women working within the corporate space. 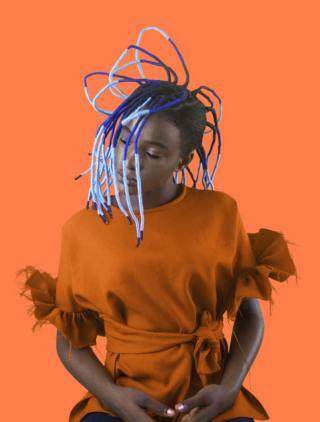 The artist’s previous personal experience of working in mostly white corporate workplaces includes people talking behind her back and making comments about her hair, which did not conform to their view of beauty. Many of the subjects in her series are students at the university where she works. She also travelled around North Carolina and photographed women in their childhood homes. The women shared their personal difficulties in gaining employment after graduation: “Employers would tell them that their natural hair was unprofessional or their name was too difficult to pronounce and would suggest they alter themselves for the job. 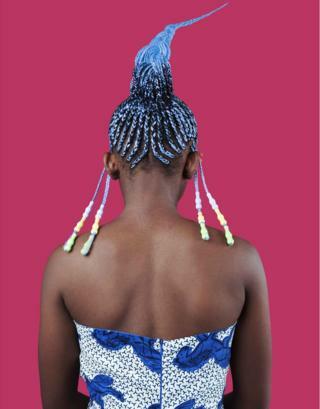 In her portrait series, Medina Dugger pays homage to Nigerian photographer JD ‘Okhai Ojeikere, who spent 40 years creating black and white photographic studies of African women’s hairstyles. 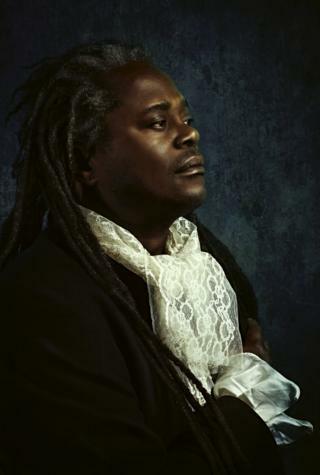 Ojeikere’s work helped establish modern celebration of black hair culture, documenting African hair-braiding methods that date back thousands of years. 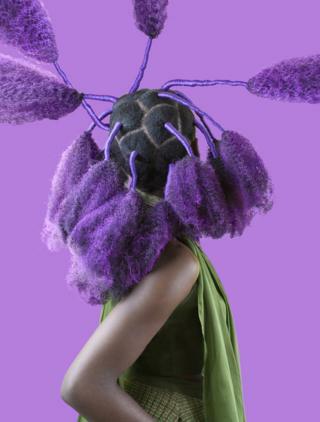 Nigerian hair culture is often an extensive process, which begins in childhood, with methods and variations being influenced by social and cultural patterns, historical events and globalisation. 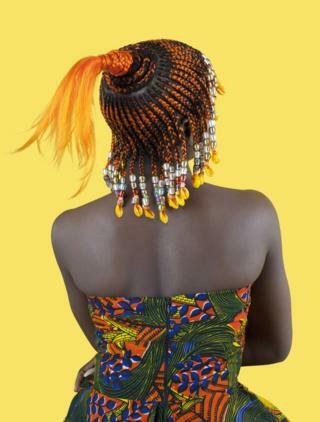 Traditionally, Nigerian hairstyles can be purely decorative or convey deeper meaning and symbolism around social status, age and family traditions. 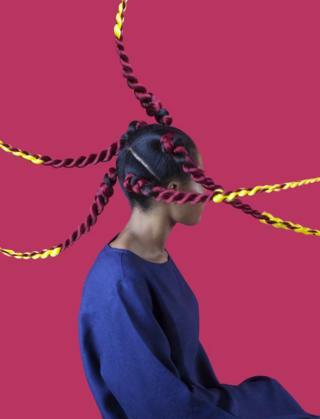 In her portraits, Dugger experiments with historical and imagined hairstyles inspired by Ojeikere but also by Nigerian hairstylist Ijeoma Christopher, along with hairstyles she has seen in Lagos. The women in the photos helped decide on the vibrant colours to suit their personal preferences. The exhibition How Do You See Me? runs at the Catherine Edelman Gallery, Chicago, until 27 October.